Brown rice isn't very high in calories, but for the calories you do get, you'll add a lot of nutrients. This steamy side dish gives you fiber, as well as several vitamins and minerals. To keep it as healthy as possible, steam brown rice in a rice cooker. For fewer than 110 calories, you can have a one-half cup serving of cooked brown rice. Carbohydrates make up the biggest percentage of calories in this starch, which is 85 percent to be exact. Eight percent of calories come from protein and less than 7 percent of calories are from fat. You'll get almost 7 percent of the fiber you require for a 2,000-calorie diet, or 1.8 grams, from one-half cup of prepared brown rice. Because you want to shoot for 14 grams of fiber for every 1,000 calories, notes the Dietary Guidelines for Americans 2010, you should get 28 grams per day, based on 2,000 calories. 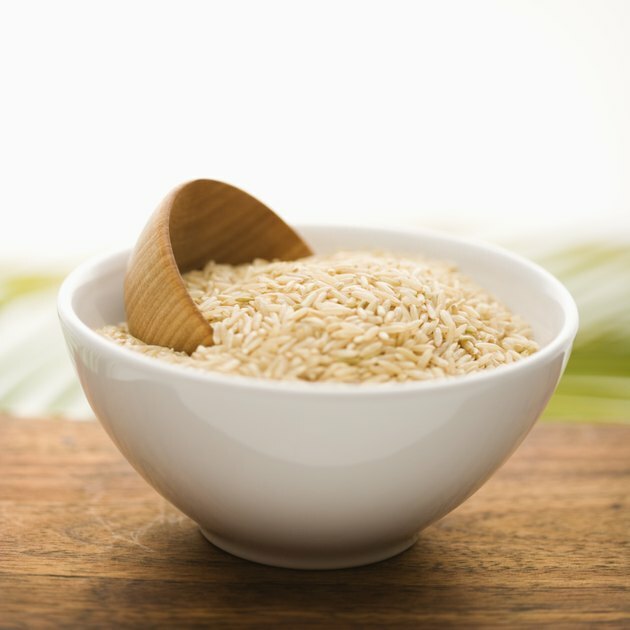 Brown rice gives you small amounts of thiamin, riboflavin, vitamin B-6, folate and niacin. These B vitamins tend to work hand-in-hand to pull energy from the foods you eat, while supporting brain processes and blood-cell formation. You'll also get magnesium, phosphorus and a little calcium, to keep your bones strong; in addition to potassium and a minimal amount of sodium, for fluid balance and heart functions.